"Finis Terre" , (ex Anja) launched 1964, around the world-sailing 65-67, North Atlantic cruises from Denmark 1975-1989, and from 1992 mostly Baltic cruises. 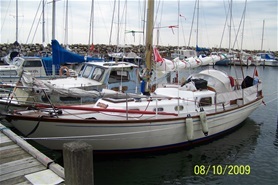 Was in 1992 overhauled on a Szczecin shipyard in Poland and had teak-seats in cockpit, teak on al hatches and the original one forestag rebuilded to a double-forstag. Also the anchor-box in the forecabin was removed. Instead a anchor hatch was cut in the forepeak, that now host anchorlines, forelines by landing - and - a 220V electric connection from land. It means easy and quick electricity while visiting foreign harbours and a lot less troubles using anchor-gear. The old danforth anchor still sail on boars, but now in the rear end behind the cockpit. Often ín Baltic harbours you will have to launch a rear anchor when there are no bouys or harbour-poles to connect to. A new anchor-bridge (double) now host a 25 kg plough-anchor - always fitted for rapid use in the front. Together with a lot of other alterations in the cockpit Finis Terre is now more easy to stear single-handed and a dream for the two-some sailings. Which she has done for many thousinds seamiles since 1992. More update-details will be launched accordingly during 2012. (see next page: Finis Terre 1992-2012).